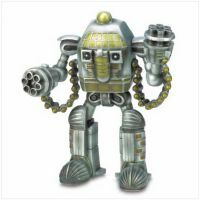 The Astronaut Robot Figurine is an impressive, futuristic looking toy, ready to take on his enemies. It is a perfect accompaniment for any robot lover’s collection. This detailed figurine is straight out of an outer space battle, complete with automatic hand guns at the ready, and plethora of pretend weapons and defenses that your child is sure to adore.